Needing a quick meal in the middle of my trip from Surrey to Coquitlam, I decided to visit Okonomi Sushi, which happened to be situated right outside Columbia Station, where I had to make my transfer from the Expo Line to the Millennium Line. Okonomi Sushi in New Westminster is known for its reasonable prices, extensive menu choices, pink rice and unique decor. By unique decor, I mean that there are literally sofas that you can sit on while you dine! 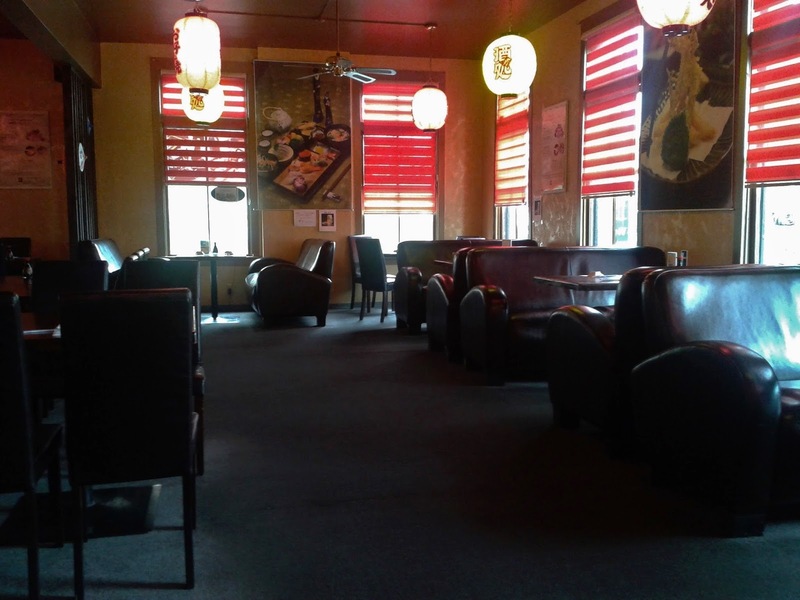 The restaurant's interior design reminded me of an 80's lounge, and to help you picture that, I took a photo of the dining area. My food came very quickly. In fact, it all came before I could finish typing the names and descriptions of the dishes onto my phone. The Gomae came in a very large bowl, which made it look very small, but it actually had a good amount of spinach and sesame sauce. The spinach was served slightly too cold and there wasn't really an attempt made to evenly mix the sauce with the spinach. The sauce itself was a little off - it tasted like sesame paste with some water mixed in so that it would sort of have the right consistency. 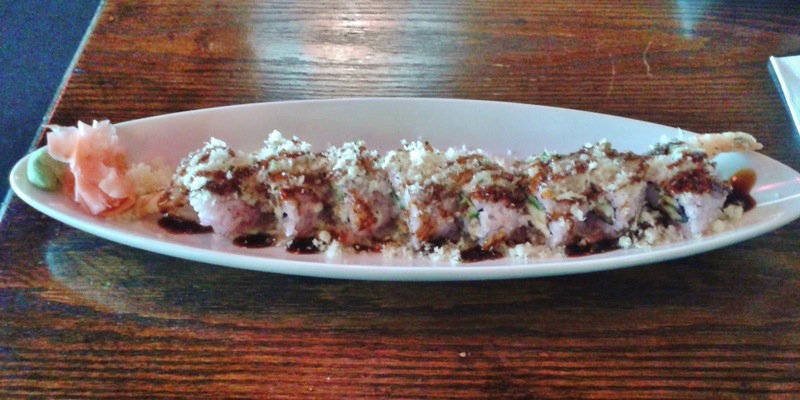 The Vancouver Island Roll came with prawn tempura, unagi (BBQ eel), cucumber, flakes, and wrapped special sauce. Yes, "wrapped special sauce". I thought it was a typo when I first read it, but I also saw that many other items on the Special Rolls menu had this "wrapped special sauce". What in the world was this "wrapped special sauce"? It turned out to be a very strong teriyaki sauce, almost like a balsamic reduction. Considering its intensity, I would say that it was applied in the right amount. 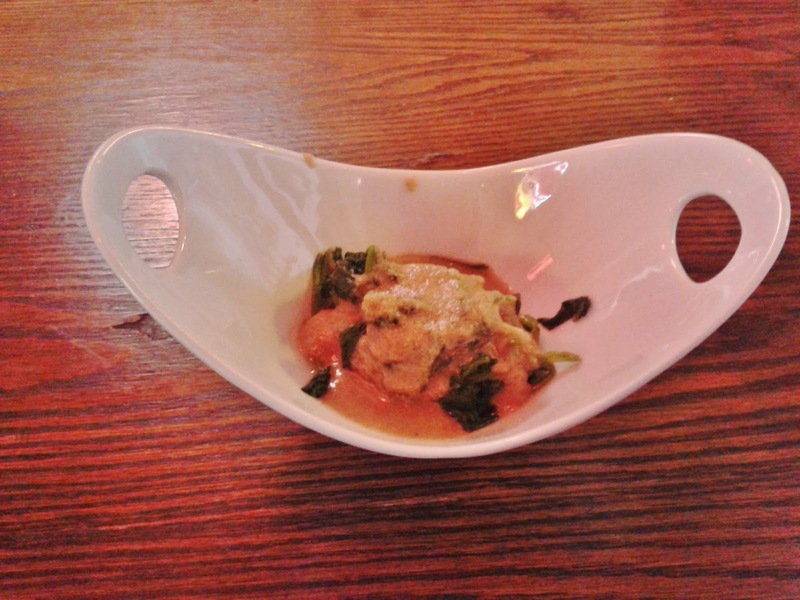 However, I would have preferred a weaker sauce applied in a more copious amount as the roll teetered on being dry. Notice also that the roll has pink rice! This is the only restaurant to feature pink rice, which is made by adding fruit and vegetable extractions to make it more healthy. The flakes were extra crunchy, the tempura prawns were flavoury and soft, while the unagi shyly hid behind the prawn. 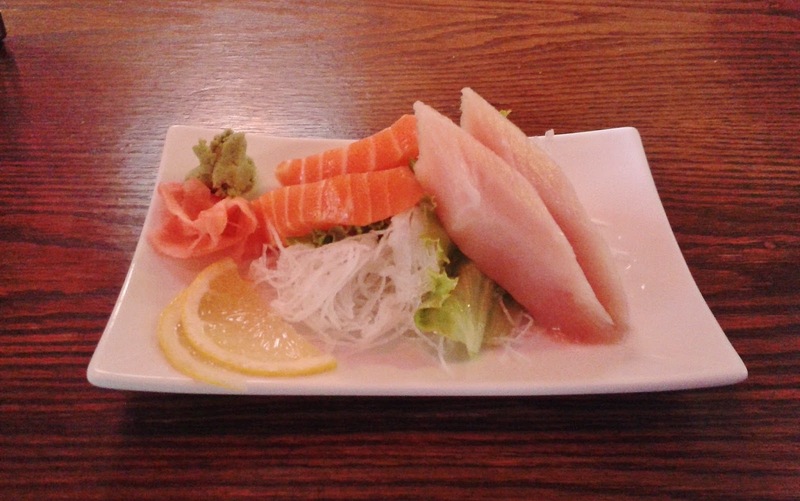 Next, I got the Appetizer Sashimi, which came with two pieces of salmon sashimi and two pieces of tuna sashimi. Both the Salmon Sashimi and Tuna Sashimi were cut neatly into pieces that were quite large. There was nothing amiss about the taste of the Salmon Sashimi, which despite its large size, had a very soft and smooth texture throughout. The Tuna Sashimi was tougher in the middle, but soft on the outside and tasted fresh just like the salmon. I guess out of all the temaki (hand rolled sushi cones) that I could choose from, I just had to choose the wrong one. The chopped scallop had way too much mayonnaise, which turned it into a bit of a creamy mess. 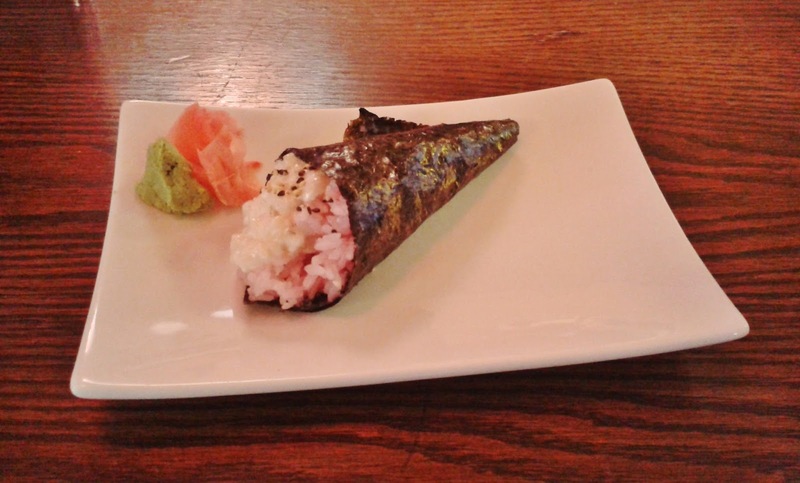 The seaweed was one of the toughest I have ever had for temaki. (Maybe it was rolled too many times?) To top it all off, the chopped scallop tasted like chopped century egg. Whoops! At the end of the meal I got a 5% discount! I have visited Okonomi Sushi previously and have usually gotten discounts of various amounts, though I have not managed to figure out what their discount rules are. Consistent with my previous visits, their portion sizes tend to be at least average in size if not larger. It seems that they also have plans to open an Izakaya soon with extended hours.